The Hochmosel Bridge (German: Hochmoselbrücke or "High Moselle Bridge") is a highwaybridge under construction that traverses the Moselle valley near Ürzig and Zeltingen-Rachtig in Rheinland-Pfalz, Germany. The bridge is part of a new highway connection, the "Hochmoselübergang" or Federal Highway 50 (Bundesstrasse 50), to facilitate traffic between Belgian and Dutch harbors and the greater Frankfurt area. A proposal for the highway and bridge was first made three decades ago for strategic reasons during the Cold War. The project was reactivated to link the Frankfurt area, specifically the Hahn airport, to the Belgian and Dutch harbors with updated plans drawn in the early 21st century. 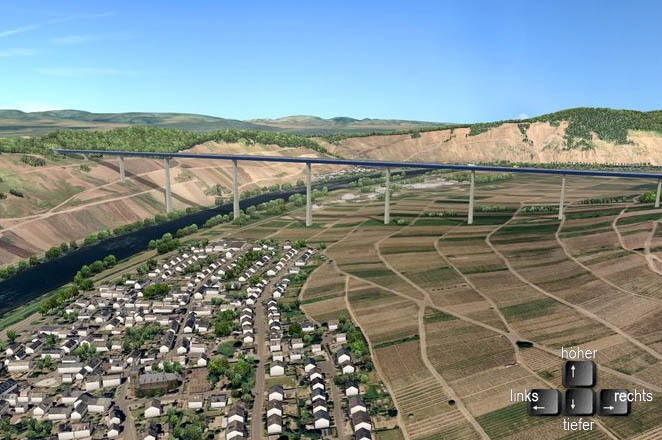 The plan calls for a 1702.4 m long steel box beam bridge that crosses the river at a maximum height of 158 m. The width of the bridge will be 29.0 m to allow four-lane traffic. 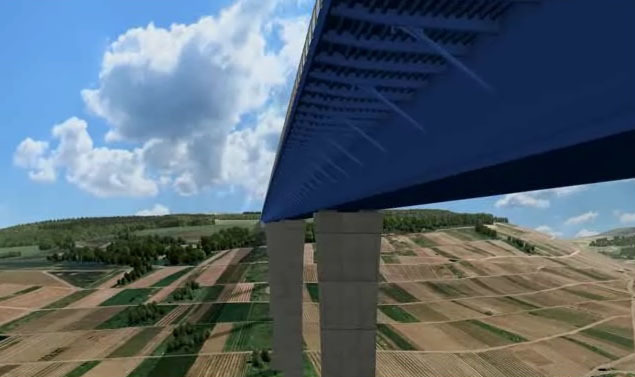 Ten monolithic pylons made from concrete will support the bridge; their height varies between 15 and 150 m. The estimated costs are 270 million euros. The project is to be completed by 2016. Opposition to the project is based on questions of its economical necessity and the negative ecological impact on the Mosel wine region. 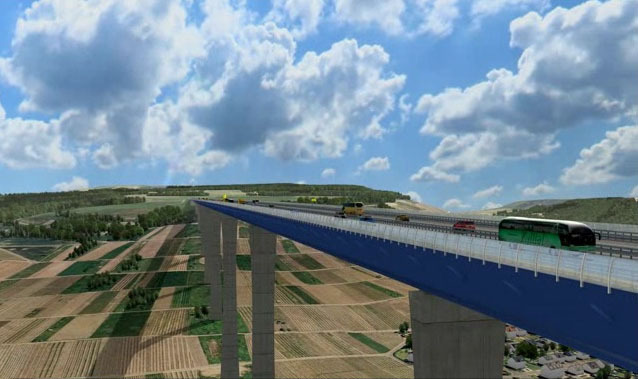 It is indicated that current available highway connections between the Belgian and Dutch harbors and Frankfurt are adequate, and the proposed highway with its bridge would not present a shortcut and thus would not be economically advantageous. 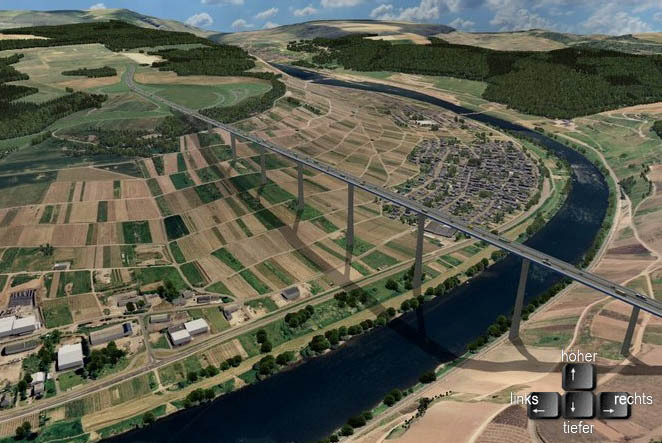 More importantly, perhaps, is the concern that the "ungainly" bridge would destroy a historical cultural section of major significance within the Mosel wine region. The section is home to some of the finest and most historical vineyards of Germany A potential change in the local ecosystem will affect the premier riesling areas of the Wehlener Sonnenuhr, Graacher Himmelreich, and Ürziger Würzgarten. International wine experts, among them Hugh Johnson, Jancis Robinson and Stuart Pigott, are opposing the project and fear that the unique microclimate responsible for the Mosel rieslings will be impacted.